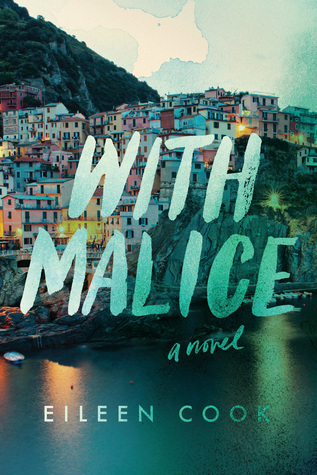 I was interested in reading With Malice because I thought it was a thriller, and I love thrillers. Then I was a bit more excited for it because I'd seen another blogger read it and really, really like it. I kept meaning to pick it up but never got the chance to, and then I finally did pick it up. And I've learned that With Malice isn't a thriller so much as it is a (rather mellow) mystery of sorts. And, as a whole, it's underwhelming. Here's the thing about With Malice: it's like Guilt or the Amanda Knox trials, except it's less gruesome and bloody and is basically a G-rated version of those (though the book itself is not G-rated). It starts off with Jill waking up in a hospital with a broken leg and six weeks of brain loss after being in a car accident, and she soon learns that the accident killed her best friend Simone, with Jill behind the wheel. And some people aren't so sure it was an accident. From them on the story slowly and patiently builds up to a climax and the answer to two questions: Was it an accident? If not, who killed Simone? The problem is that, when the answers do come, they're so quick and just plain anti-climatic, and that ruins the steady pacing that was working up to the moment. I could handle that not much was happening--we got to see the various sides of a misconstrued story, see the effects on various people, see truths and lies and befuddlement. That was interesting and a fresh point of view, seeing how people were so quick to blame Jill and burn her at the stake when they didn't even know her and there was no proof. But it wasn't the worth ending. Part of me can't say anything more because it could spoil With Malice, but really, there's not a whole lot to spoil and not a whole lot to say, period. It's hard to discern if Jill is a reliable narrator or not because, if she were to gain back parts of her memory, it may not be her memory--just images in her head. (Her therapist/psychiatrist explains it.) We know Jill as Jill knows Jill, but through interviews and blog posts and Facebook comments we get to see how Others know Jill. Same goes with Simone--everyone thinks she's an innocent angel, but Jill would beg to differ. Their relationship is another mystery as you try to figure out what exactly it is, despite the fact that they claim to be best friends and sisters by choice. It's not just the mystery behind who killed Simone; it's the mystery of Who are Jill and Simone? Honestly, I really don't have anything else to say. As far as With Malice goes, I think I just thought it was going to be something else. I didn't dislike this book. The pace actually wasn't all that bad, though it lacked thrills and gasps and a heart beating fast. But it's like I already said: the ending and climax made it all for nothing. It was just so anti-climatic and not at the right part of the novel and didn't give enough or take enough time and was a disappointment when compared to the rest of the novel. I just happen to like my thrillers with a bang. But this wasn't a thriller. And the bang backfired. Who would I recommend it to? If you like a mystery that's very mysterious and less about the reveal and more about the effect--and if you're intrigued by cases like the Amanda Knox trials and television shows like Guilt, to an extent--then this may be the book for you. Thank you for sharing your thoughts on this book! I have been undecided about this one, but the cover seems so stunning! Thanks also for signing up for the #VASRP! Hope that your summer is filled with wonderful books and adventures!